Not all that long ago, the only place in the Greater Chicago area to get a respectable bowl of ramen of any style was Santouka at the Mitsuwa Market in Arlington Heights. 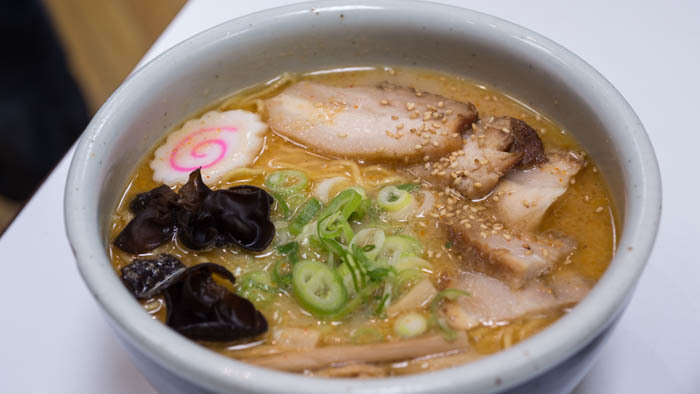 But over the last few years, with the ramen craze hitting the national food scene, other legitimately good bowls gradually became available around Chicago, just as has happened in other U.S. cities. Recently, I’ve been wondering how my favorite bowls of Chicago ramen would stake up against each another if they were tried as a bang-bang-bang-bang, as Louie CK might put it - meaning eaten consecutively one right after another. Laikom & I recently took up this challenge, trying bowls from Santouka , Ramen Misoya, Oiistar Ramen, and the newly-opened High Five Ramen. 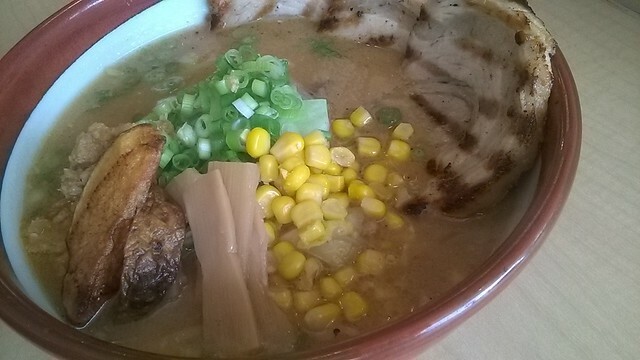 Three of five bowls we tried were tonkotsu, one a clam ramen, and the other a miso ramen. Enjoyment was our only criteria. We didn’t want to worry too much about comparing relative styles. Only about how much we truly enjoyed each bowl on their own merits. 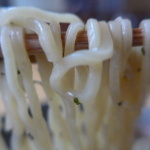 A tasty and toothsome square noodle. The grilled chashu (sliced pork) is fatty and is only lightly and pleasantly marinated while the broth is bold but not overly so. Salty for sure but not over-the-top. The bowl contains chashu, sliced potato, memna, ground pork, sprouts, and scallion. I, unfortunately, made the mistake this time of asking for the High Five Ramen without the mega-potent black garlic oil infusion since the first two times I tried it, the garlic completely overwhelmed all the other bold flavors (fresh black pepper, chile, salt, and pork) in this viscous slurry of a broth. 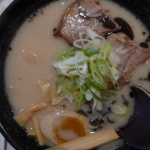 I just returned from L.A. where the present craze there seems to be towards serving mega-intense tonkotsu broths. A huge interest in tsukemen (dipping ramen) is also something to be found at many notable places there and is definitely something I’m betting will become big in Chicago over the next few years. It’s possible that since they didn’t include the black garlic oil that they felt the need to amp up the chile factor, making this intense broth an unbalanced mess. The tasty round noodles were served perfectly toothsome while the honjuku egg was beautifully molten and was also served not chilled. The chashu had the texture of a slice of less fatty, super-succulent brisket that one might find at a BBQ joint in Lockhart, Texas (Black’s, Smitty’s, Kreuz Market) sans the smoke element. Oiistar makes five types of ramen – three of which I didn’t at all care for (Pozolmen, Tikkamen, and Spicy Veggimen) being unnecessarily busy while using some odd ingredients (Jalapeno peppers, masala spicing, or avocado, for example). 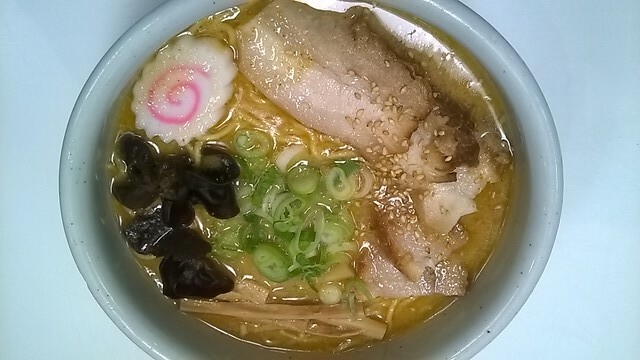 However, Oiistar’s classic tonkotsu-style Oiimen is one of Chicago’s really good bowls of ramen. The oiimen is made with thin square noodles, chashu, ground pork, scallion, woodear mushrooms, sprouts, and a honjuku egg. The less weighty but still highly flavorful broth has elegance as well as complexity with nutty/garlicy/mushroomy elements (umami) to boot. The chashu has roast beef-like qualities and is very lighted marinated. Unfortunately, the eggs here always seem to be served cold – a complete pet peeve of mine. Chef Sunny Yim told us that they make their honjuku eggs daily and hold them in an ice bath until they’re ready to be added to the bowl. I have no problem with places that elect not make eggs to order. But to serve them with an initial chill is certainly less than optimal. And as much as you want to love a place for making their own noodles, they’re good, yes, but not truly special in any way. In the end, this bowl is largely about their sensational tonkotsu broth. …In spite of them both containing chashu and ground pork. Last edited by PIGMON on September 15th, 2014, 6:06 am, edited 3 times in total. Anyway, thanks for this comparison! Okay, now I want to grab a bowl at Takashi Noodles after I leave the dentist this morning or make it myself! I've had the traditional ramen at Ani and it was excellent. The last time I was there, I had the "Italian Beef" ramen. Yeah, sounds weird, but it was actually quite good. Next time I'll get some pics. Interesting that you both like Oiistar nearly as much as Misoya. I go there the most because it's close to me (and enjoy it quite a bit) but the chilled egg pisses me off no end. We went to Ramen-San about a month after their mid-May opening and I remember being mostly impressed with the tableside conversation we had with the restaurant manager. After our chat, I left with the impression that LEYE and Ramen-San management humbly see their ramen efforts as a work-in-progress and that they’re all ears when it comes to their continuing effort to make the best ramen possible as neophytes to the noodling world. Although I thought their ramen, overall, was fairly pedestrian at the time, I left with a curiosity about where they’d be in a year’s time; simply from that conversation. StevenStern wrote: I've had the traditional ramen at Ani and it was excellent. The last time I was there, I had the "Italian Beef" ramen. Yeah, sounds weird, but it was actually quite good. Found out tonight that Ani delivers to me--and had to see how delivery ramen would fare. Ordered the Shoyu and though it's not exactly a traditional preparation, I enjoyed it. Broth was on the thinner side (not sure of the base), very thin pickles v. fermented bamboo shoots, egg was poached v. soft boiled. But while not the traditional egg, it was delivered perfectly poached and didn't break! Not sure how they managed that but it was a thing of beauty. Additional ingredients were the slivers of fish cake, chopped green onion and excellent, thin springy noodles. The broth was in a separate container from the rest of the ingredients and arrived piping hot. Once assembled with the egg stirred in, all the components melded very nicely. I thought it was a very satisfying bowl and I especially appreciated that it wasn't a salt bomb. Looking forward to trying some of the other ramen versions and more of the menu at Ani. IMO, Wasabi has the best ramen in Chicago. 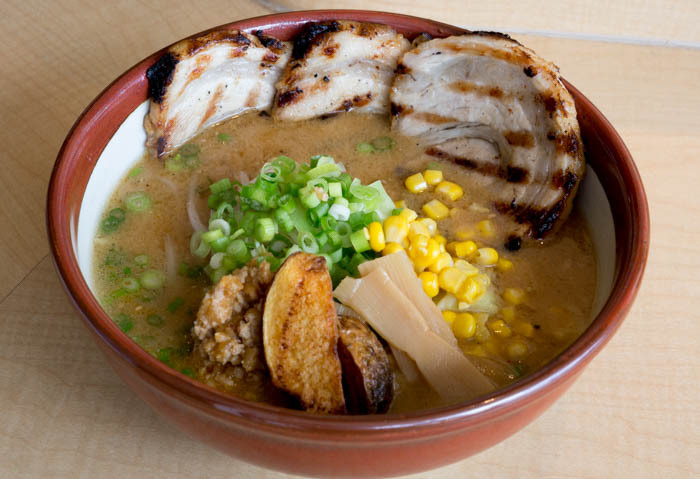 You can't go wrong with the Tonkotsu and Spicy Garlic Miso ramen, which are all pork-based bone broth. They will soon be opening another ramen join next to Publican Quality Meats called Ramen Takeya. 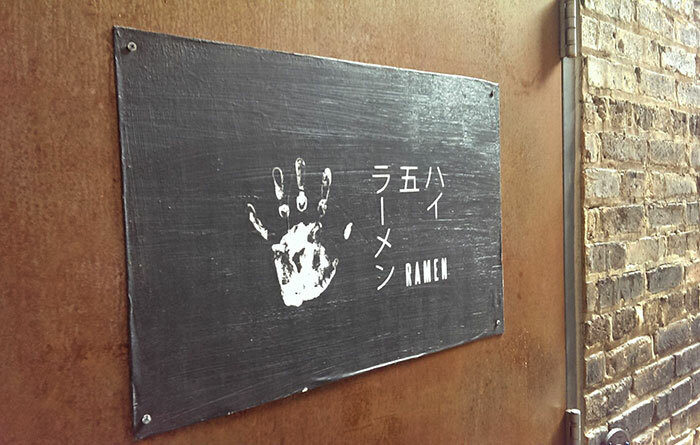 Ramen Takeya's ramen will be chicken-based broth, similar to to NYC's Totto Ramen. jin1212 wrote: IMO, Wasabi has the best ramen in Chicago. 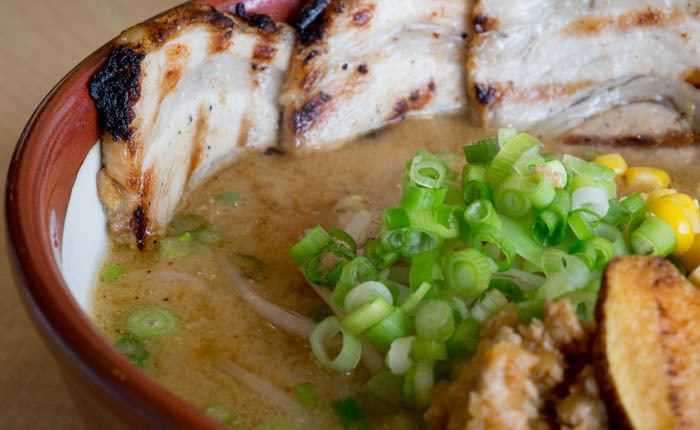 You can't go wrong with the Tonkotsu and Spicy Garlic Miso ramen, which are all pork-based bone broth. They will soon be opening another ramen join next to Publican Quality Meats called Ramen Takeya. 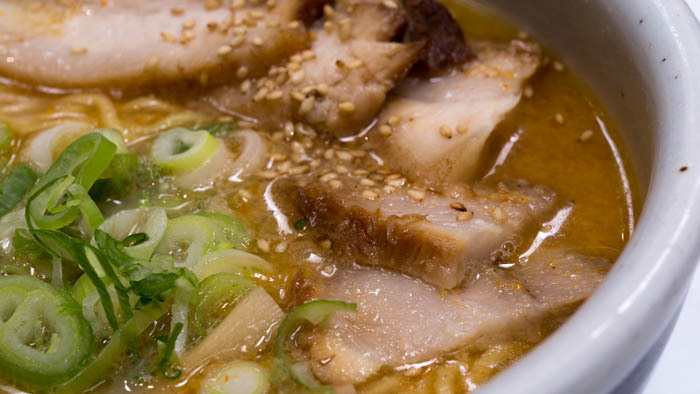 Ramen Takeya's ramen will be chicken-based broth, similar to to NYC's Totto Ramen. That is the single best bit of news I've gotten all week; I haven't been to Wasabi, but Totto was the best ramen I've ever had in my life. I really hope they can match the quality. And conveniently near my office, too! Visited Misoya last night. My friend had the same bowl pictured above. She loved the chashu and thought the only flaw was a bit too much salt; overall she was a happy camper. I had the shiro with vegetables and a corn add-on. Between noodle slurps I tried to amuse my companion by poking fun at the placards touting miso's ten benefits to one's health. But I felt so good after finishing the exemplary bowl that I started to wonder if there might be something to that propaganda. Now if only we could get a good ramen place in my neck of the woods . . . This past Friday, after taking part in a special tasting of Sierra Nevada & No Middle Ground's collaboration IPA, I walked over to High Five Ramen. I must have a better camera than Pigmon. I'll refer in these images. When you enter, do not shirk. Go down the steps and put your name (and party size) on the sign-in sheet. You might not be seated in this order, but if you wait until the line gets down to that level, you could be bypassed by somebody queuing up after you. It took me thirty minutes to be seated. That's actually pretty close to the standard for a solid ramen shack in Tokyo. I had the 'house standard' High Five Ramen [$14]. I uttered nothing additional to my waiter (black garlic oil, half-spicy?). The menu tells you it is going to be a spicy bowl. Overall, it is a good bowl. Perhaps the intent of the prolonged spiciness is to get you to order the one liter can of Asahi Extra Dry (the real thing, imported from Japan ~ not that which is brewed in southern California). Hi-Five: I had one bite of PIGMON’s signature Hi-Five, and was really glad I opted for the special clam one instead. After one bite of the Hi-Five, I had no desire for another. The thick heavy milkiness just didn’t mesh well with the overly spicy, mala, szechuan peppercorny, intense flavors. I love spicy food, I love intense food, and I LOVE szechuan peppercorns, but the only way to describe this bowl of soup was that it is a huge mess of flavors in the worst way possible. It lacks any subtlety and refinement which to me defines Japanese cuisine. One bite was enough for me. I’m glad I ordered the special which was a “clam dashi, hama hama clams, bean sprouts, garlic oil. light. clean, delicate”. 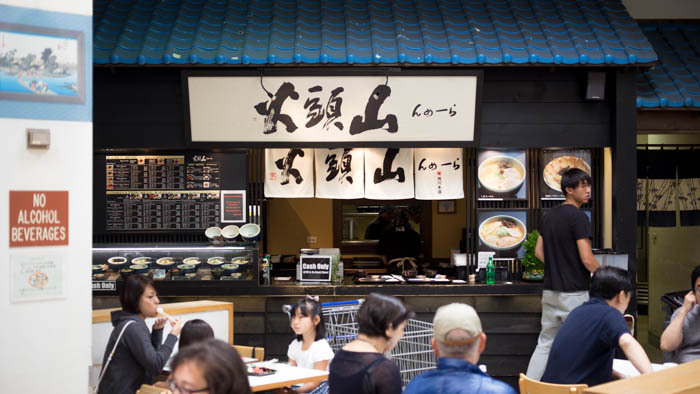 It gave me a chance to appreciate the very good noodles and superb clam dashi stock. Misoya: On the day of the tour, it was tough to pick a favorite. For a minute I thought maybe Oiistar was my favorite, it was a close toss up. It was definitely the most rounded bowl, with no ingredients or flavors that seemed out of place. But after I slept on it, I started leaning toward Misoya. Then I realized that am recommending Misoya over Oiistar to out of town friends, so it seems Misoya has taken a clear lead. The high point of the Misoya bowl is clearly the chashu pork. It is not only the clear best, but is so by a long mile. Fatty, but freshly grilled. Also, they give you about 2 to 3 times the portion, making this bowl a better value to me. The broth was great, maybe a small step down from Oiistar, and the noodles were probably my favorite of the whole tour, close to Hi-Five. The only thing that threw me off was the inclusion of corn and fried potato in the bowl, which to me was silly and out of place. It tasted fine, but reminded me too much of dormroom ramen. Next time I will order the honjuku egg, hold the corn and potato, and I’m sure it will be up there with the best ramen I have ever eaten. Bonus dish. 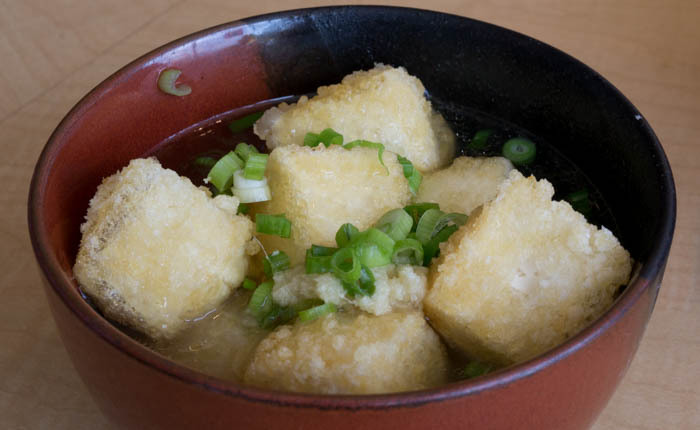 Agedashi tofu. Terrible rubbery breading. Flavorless saltless broth. Avoid at all costs. Oiistar: If Hi-Five was a complete mess of a bowl, then Oiistar is the complete opposite. While I enjoyed elements at Misoya more (the noodles and the chashu), Oiistar is probably the most refined overall package. Unlike PIGMON, I actually love the combination of ground pork and chashu in both. I love the texture of the ground pork. Oiistar probably has my favorite broth, though I’ll have to return to Misoya a few more times to verify this. As silly as it may sound, texturally I love the slivered scallions in this bowl over the typical chopped ones. Overall Oiistar, for now, wins the award for most rounded balanced package. Santouka: I feel that a lot of people have a soft spot in their heart for Santouka, especially the old-timers. I understand that at one point it was the best and maybe only legit bowl you could get in the Chicagoland area. That doesn’t change the fact that it’s now toward the bottom of the list. The broth is very good, and probably the only saving grace in this bowl. The pork was tender but lifeless. The noodles have little integrity, basically turning into wet flour once they hit your mouth. I love the food court vibe, very lowkey. Bonus dish. 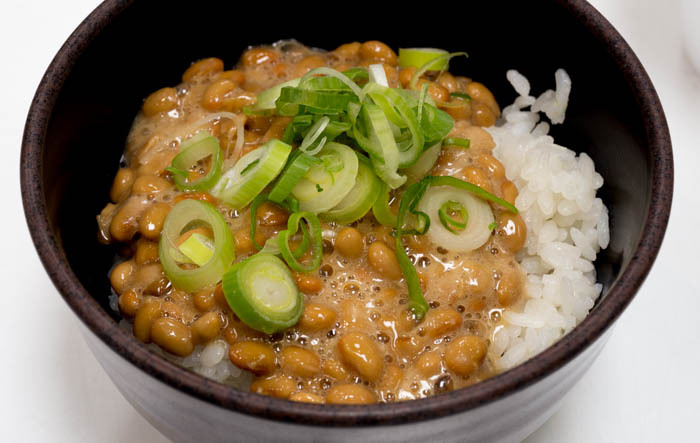 Natto over rice. It's natto. I like natto. Strings in Chinatown: a bit fatty, but I see potential, will revisit in a few months. Oiistar: echo above comments. Well-balanced (though I have an extremist palate and I don't go out looking for balance per se). Big fan of both pozolmen and chadolmen (beef). Yusho (Sunday only) Logan Poser ramen. The piggie tail is genius (which does distract from the ramen but darn it that's a good tail). Can't wait to try their angry red ball spicy ramen. Wasabi, ramen with savory garlic. Currently my platonic idea of ramen. Thanks so much for the comparisons and rankings. I was pretty much sticking with Santouka, because for so long it was the only place (plus I can shop after I finish eating). Now I can't wait to try Misoya. The others look great, too, but having them near where I live makes stopping in a lot more likely. Went to Santouka this weekend. Was the first time there in quite a few years. Waited a half hour or so in line then another half hour for my food. Ok, it is what it is. First off I will say I loved, loved the ikura, salmon rice bowl accompaniment. It made the meal for me. The ramen itself (I had the miso with cha-shu) was good, but far from great. The noodles were a bit thin and to me uninteresting. The pork was succulent and delicious, but seriously - one tiny piece? The broth was well balanced and not as viscous as Misoya. I wouldn't say it was better or worse as it's obviously simply different. For my money I would go to Misoya each and every time. Just my 2c. Last week, I went to two more ramen shacks. Both were new, although technically, one had merely relocated. They were Ani on N. Lincoln Ave.; and Wasabi on N. Milwaukee Ave., now closer to Armitage Ave. than Logan Square. Service @ Ani was prompt, and enthusiastic. I punted for the italian beef ramen. The noodles were good. The vegetables worked in this bowl, but I felt (and I politely told a person there this as I was leaving - servers asked, but I didn't want to have other patrons hear me) the italian beef itself needed some sort of flavoring or curing. It was also a bit too large. It wouldn't fit into the spoon, and it wasn't easy to cut with just chopsticks. I will give Ani another shot. But I won't have this flavor bowl again. At Wasabi, I elected to go for its stock Tonkotsu ramen. This was a pretty good bowl. The pork was tender and tasty, the noodles were hot, the vegetables were chewy and savory. Wasabi definitely gets more shots. Last edited by pudgym29 on November 16th, 2014, 12:31 pm, edited 1 time in total. 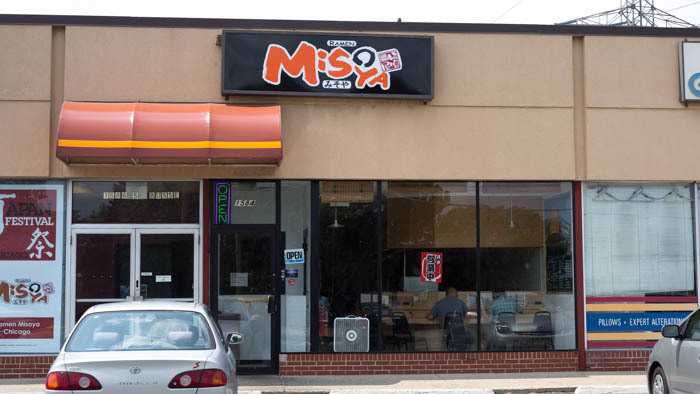 Maybe I should give Misoya another shot, but the first two times I tried it, which were both relatively soon after it opened, I found the pork unpleasantly tough. At Santouka, I always get the special pork option and it is probably the best ramen pork, on a consistent basis, in my experience. I don't have quite the issues with the noodles at Santouka that others have noted though I can see the preference for Misoya. I do ask for the noodles on the harder side. 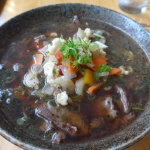 I like the broth at Santouka significantly more than the couple times I tried Misoya. The egg at Santouka is a disgrace. In the city, like Oiistar and Wasabi a lot. I think I actually like Oiistar slightly better though they are both very good and it's close, but we go to Wasabi a lot more as it is walking distance and a little more kid friendly (though I wouldn't necessarily call Oiistar kid unfriendly). Ramenfest Chicago: November 8, 2014. I did not know this was happening. How did I not know this was happening? Independent George wrote: Ramenfest Chicago: November 8, 2014. And they're already sold out and taking waiting list names. If you click on Buy Tickets, it looks like they will offer more tickets on Oct 1 and Nov 1 at progressively higher prices. I had a late lunch at Strings yesterday and tried the Tonkotsu ramen based on another recent ramen review and liked it, though not as much as Mike G. The noodles were kind of par-cooked--when I first tasted them, they were a bit too "crunchy" still, which was a bit off-putting, but as they finished and soaked in the broth, the texture was nice. Speaking of the broth, I don't think I liked it as much as Misoya or Santouka. It wasn't a salt bomb, which is good, but it was just a tiny bit sweet--I added some of the chili oil (which was very good by the way) to counter balance it and very much enjoyed the bowl. But I don't normally add anything. Still, a more than decent bowl and extra stars for convenience--I pass through Chinatown at least 3-4 times a week--so happy to find them. The owner of the Yan'an noodle shop, known only as Zhang, admitted he bought 4.4 pounds of poppy buds in August. The buds contain the opium poppy seeds, from which the addictive narcotic opium is made. Zhang allegedly crushed the buds into powder form and mixed them into menu items. Police discovered the secret ingredient after one of Zhang's customers, Liu Juyou, 26, tested positive for drugs during a routine traffic stop. Cops held Juyou for 15 days until he sent relatives to the restaurant to eat the noodles in question. After the family members tested positive for drugs, police launched an investigation. Dropped in on Strings on a drive back from downstate. Chinatown is so convenient from the freeway or LSD, sometimes one forgets. I'm torn by this place. Among all the gimmicky new ramen spots, this one is the most authentically gimmicky. 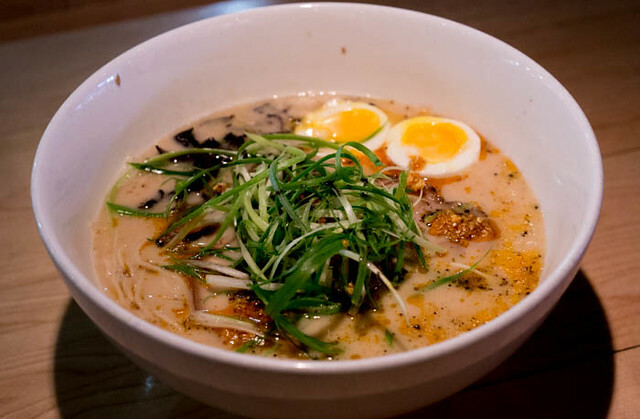 It has the look, feel, and maybe reality of a young, hip, Asian ramen spot. As opposed to that same thing through the Melman/Sodikoff/Logan Square Pants lens. Feels more like a place in Little Tokyo or Torrance than other places in Chicago can pull off, if that makes any sense. Lots of nice ramen-lovin kids working there and eating there. Otaku, I guess. Really liked the more-with-less decor, including the plants in water jars all over. I was excited by the oden setup the way I was excited by the charola setup at Chaparrita. Seemed to be just like the one I saw on TV, or at Torihei. The comparison ends there. My radish and soft boiled egg came in tepid, barely warm, dirty dog water as Sula called it in the Reader. And the egg's yolk was cooler than Miles Davis. But that "broth" temp seemed to be right in the incubatory sweet spot. The "hot" water from a bad motel shower. No primordial soup for me, thanks. I had the tonkotsu. Broth was pretty good (and hot). The bone was in there, you could tell. I agree with others here that it lacked depth of flavor, and needed some doctorin'; I think I killed it with the overly-salty and MSG-y miso chili sauce (which still tasted great, by the way, and it was my fault for loading up on it). First, do no harm, should be my rule with condiments, but I have a problem. The Berkshire pork was excellent, the other ingredients mercifully few and fine. The noodles baffled me. I like a thicker, more rustic string, but that's not a criticism just a style choice. I agree with all the others that these noodles begin a few notches before al dente. Toothsome is good, chalky bad, but these were right on the cusp between those. Al dente, piu’. Thinking back, I've had many bowls of ramen that were served with perfect noodles that, like your author, went soft and flabby near the end. Strings does it the other way. They are fairly objectively not quite done when served, and pretty perfect at the end. It's an odd approach, but I don't mind and I think I might be more partial to an underdone noodle over an overdone one. Setting aside ramen-yas that suspend time and physics, Strings takes a logical approach. I don't eat a lot of ramen, and I can't speak to truth to style or even compare my recent bowl of "High Five" tonkotsu to whatever you'd find at Oiistar, Misoya, etc. The space was pretty cool, evoking the tiny places I liked when I regularly haunted the East Village some years ago, and the service was personable and right-on, as I've come to expect from a Sodikoff joint. I wasn't so hot on the ramen, itself; the noodles were firm, the pork belly slabs chopstick-tender and the scalding broth was rich, thick and dark - forbidding, even, telegraphing the promised endorphin rush to come - but there was way, way too much sansho pepper in it. Sansho's a funny thing; it's highly volatile, and high temperatures seem to tame its lightning-like intensity. At first, ginger was the dominant spice after the heat (cue Brian Eno), but after a few minutes, that familiar high-toned crackling accumulated and took over. I couldn't stop salivating, yet my mouth was dry, and when I drank a glass of water, it felt and tasted electrified. Mind, I love me some ma-la, and I like "flavor tripping" my friends with sansho - pop one seed, and the lightest adjunct lager tastes like a doppelbock (it also makes food taste saltier than it actually is, like a savory miracleberry) - but when your broth makes tap water taste like somebody dropped a nine-volt battery in the glass, you need to dial it back. It's a damn smart way to encourage drink purchases, though. syncretism wrote: I don't eat a lot of ramen, and I can't speak to truth to style or even compare my recent bowl of "High Five" tonkotsu to whatever you'd find at Oiistar, Misoya, etc. The space was pretty cool, evoking the tiny places I liked when I regularly haunted the East Village some years ago, and the service was personable and right-on, as I've come to expect from a Sodikoff joint. I wasn't so hot on the ramen, itself; the noodles were firm, the pork belly slabs chopstick-tender and the scalding broth was rich, thick and dark - forbidding, even, telegraphing the promised endorphin rush to come - but there was way, way too much sansho pepper in it. Sansho's a funny thing; it's highly volatile, and high temperatures seem to tame its lightning-like intensity. At first, ginger was the dominant spice after the heat (cue Brian Eno), but after a few minutes, that familiar high-toned crackling accumulated and took over. I couldn't stop salivating, yet my mouth was dry, and when I drank a glass of water, it felt and tasted electrified. Mind, I love me some ma-la, and I like "flavor tripping" my friends with sansho - pop one seed, and the lightest adjunct lager tastes like a doppelbock (it also makes food taste saltier than it actually is, like a savory miracleberry) - but when your broth makes tap water taste like somebody dropped a nine-volt battery in the glass, you need to dial it back. I actually never knew (or forgot) the Japaneses word for them, thanks for pointing that out. Obviously we feel the same way. What the heck is going on in that bowl, seriously. laikom wrote: overly spicy, mala, szechuan peppercorny, intense flavors. I love spicy food, I love intense food, and I LOVE szechuan peppercorns, but the only way to describe this bowl of soup was that it is a huge mess of flavors. I don't even mind too much sichuan/sansho/szechuan peppercorns... I think it's fun in a sichuan hotpot when there are other food items at the table and you're not stuck to the one soup. Sitting down at hi-five, you have one thing to eat and you're stuck with it. The soup was just too heavy to also have the sansho peppers at that level, and even if you can handle the carb load, i don't think you can really ask for a side of rice to go with your ramen. Tirade aside, I should probably get back and go for their most mild bowl. I'm guessing (pretty sure), that it would be great. If you finish your noodles, but have broth left over, do not leave the bowl unfinished for the chef to see. Ramen is a macho food. You finish that broth! If you want some rice, or more noodles to help top you off, just yell it out at the top of your lungs and you’ll get it. But you finish it! Oh, man; did I commit a faux pas? And while I was working, they sold out of their last block of tickets today. My experience at Strings echos Jen and Jeff above - rich broth smacking of bone, perfectly cooked meat, and noodles that started with a crackly filament of raw remaining in each center, that slumped into perfect submission by the end of the bowl. Egg was served separately and at icebox temp. I cut in half in the bowl and then let each half float in the soup to warm, and they were perfectly runny and reasonable within a few minutes, but I'd much rather have them perfect and warm to start the service. Pickled veg were right on, freshly toasted nori, sesame, quite a happy bowl over all, and the room and service were warm. Good canned royal milk tea as well (why this appeals when Saint's Alp is next door, I'm not sure, but it hits the spot, and I enjoy it at the NYC ramen places as well). I am really digging the Logan Poser Ramen at Yusho Hyde Park right now (executed better than the original in multiple visits), which has better fixings, but I thought the broth at Strings was a notch up. The Winter Special is a Hell Ramen with clams and shredded hot peppers, ranked 1-4. If you order the 4 and eat it within a certain number of minutes, you win something - perhaps a hot egg.